Cocobolo, a native of Panama, is a very dense, durable tropical wood whose heartwood is deep red-brown in color with beautiful figuring of lighter and darker lines. It gives off a faint pleasant spicy aroma when being worked, but is otherwise odorless. Because of its high oil content and dense structure, cocobolo does not require a finish for protection. Therefore, these pieces are finished only with a light coat of hard, colorless (neutral) wax. Jatoba, also known as Brazilian cherry, is a very hard, dense wood from South America. The heartwood is dark red-brown in color and polishes to an attractive luster. Owing to the deep reddish color and prominent lighter pores, turned pieces incorporating curved surfaces near the end grain take on the appearance of a ripe, deep red strawberry. Interestingly, the Brazilian cherry tree exudes the gum resin copal from its bark. Copal resin is used, in combination with a drying oil like tung oil, in the manufacture of varnishes. These pieces were finished with a light coat of tung oil varnish, topped by a coat of hard, colorless (neutral) wax. Caution: The rims on these vases are very delicate and, due to the weight of the vase, can break if dropped! Kempas, also known as Impas or Mengris, is the wood from a large tree native to Maylasia and Indonesia. The moderately dense wood is brick red when freshly cut, but ages to deep orange-red with streaks of yellow (due to the pore structure). On a cross-sectional surface these pores are prominent and give curved surfaces the appearance of a ripe, deep red strawberry. This particular sample was discovered as a piece of driftwood on the beach at Assateague Island, Virginia, probably blown overboard from a passing freighter. Identification was difficult, but worth the effort, as this wood was just too beautiful to pass up. 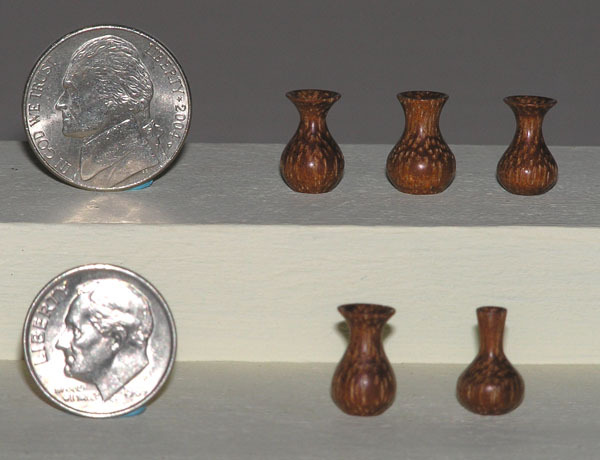 These pieces were finished with a light coat of tung oil varnish, topped by a coat of hard, colorless (neutral) wax.